DEADLINE EXTENDED! Take the SCoPE (School Communications Performance Evaluation) Survey NOW!! NOW open until MARCH 18. Participation takes about 10-15 minutes or less and is completely anonymous. Your feedback is important! PARENTS: PLEASE TELL YOUR FRIENDS AND NEIGHBORS WHO DO NOT HAVE CHILDREN IN THE SCHOOLS TO PARTICIPATE IN THE COMMUNITY VERSION OF THE SURVEY! Your help is appreciated. Watch Angela Castronuovo in the 2 mile at 10:40am; Jade Sessions in the 400 at 11:45am, the 4×800 meter relay at 3:50pm. Times are approximates, but should be close. CALENDAR CHANGE: THERE WILL BE NO SCHOOL ON MONDAY, MARCH 28, 2016. As of today, we have used one snow day (out of the 5 days built into the 2015-2016 school calendar) and March 28 is designated as the first give-back recess day. Consider running for the CCSD School Board. Three seats are up for election. Candidates must be at least 18 years of age, a U.S. citizen and a district resident (for the past 30 days). Information and petitions can be obtained by contacting me atsdieck@carmelschools.org Petitions are due by 5:00 pm on Monday, April 18, 2016. Requests for transportation for private/parochial school and/or childcare locations for the 2016-2017 school year are due by April 1, 2016 to the transportation office. Applications can be found on the CCSD Transportation website. Visit http://bit.ly/1PPvkIB today to like & share the KPS video, “Students in Our Class Know How to Keep Swimming.” Your participation will give KPS 3rd graders in Mrs. Burnell and Mr. Tompkins’ class a chance to see the movie “Finding Dory,” as a gift from Ellen DeGeneres. Make the video go viral to really catch Ellen DeGeneres’ attention! Continuing Ed registration is ongoing. Still openings in many great programs.Check it out! FOLLOW @CarmelHS_info and @CCSD_Athletics on Twitter!! The CHS Parents Association Merit Award application is now available.Applicants must be graduating with their class this June and must attend a technical school, 2-year college, or 4pyear college after graduation. Applications may be downloaded in the scholarship section in Naviance. Completed applications are due by 5pm on Tuesday, April 26. Seniors wishing to apply for scholarships to be given on Senior Awards Night (in June) must complete and submit an application by March 16, 2016. The application can be found in each student’s “About Me” tab in Naviance. No late entries will be accepted. For questions, students can contact Mrs. Petersen or Mrs. Vest at CHS. Family Fun Night, TONIGHT! Friday, March 11 in the GFMS Gymnasium from 7-9pm. Fun-filled basketball game in which staff and students play. The PTA will be selling refreshments, 50/50 raffle tickets and spirit wear. Admission is $5/pp at the door. This is not a drop off event. GFMS Music Parents: The Music T-Shirt deadline has been extended through TUESDAY, MARCH 15th. Don’t forget to get your orders in. Click for the order form. Time. Yearbooks. Both are running out! The GFMS yearbook is filled with all the moments that have made our school year memorable. There are a few copies left, but not many. Buy today! Visit www.jostensyearbooks.com Yearbooks are $48 plus sales tax. The Annual GFMS Walk for Heart Event, to support the American Heart Association, takes place during the week of May 3-6 during PE classes. Kick-off date is April 4 & 5. Students who raise $150 before this kick-off date will earn the “Toby Top Dog” price in addition to other great prizes. Surprise incentive for all students who create their online donation page and send 15 emails. Visitheart.org/hoops and search for George Fischer Middle School under Carmel, NY. Matching donations accepted. GFMS Spirit Wear is available for purchase. Check out the GFMS PTA Facebook page for updates and news! The March edition of Mrs. MacCarthy’s Caring for Kids newsletter is chock full of information on Transitions & more. Check it out! Time is running out!! Don’t miss out!! Yearbooks are available for purchase atwww.yearbookordercenter.com using code #20839. Cost is $25 through March 30; $30 after March 31. Quantities are limited. NOTE: Fourth graders receive a free yearbook, courtesy of the MPES PTO! Mixed bag fundraiser information has been sent home with your student on. Consider participating in this exciting fundraising opportunity! Orders are due byMarch 29. The MPES School Store has great new items for the new year. All items are $1 or less. Mark you calendars, upcoming school store date is March 18. MPES Spiritwear is in and available for purchase. Amazing, comfy sweatshirts, t-shirts, etc. Buy some Spiritwear today for your favorite MPES student! Contact the MPES PTO for more info. SAVE THE DATE: This year’s Color-A-Thon is Saturday, April 9 at GFMS. Fundraising packets must be returned by March 11, however online donations will be accepted until 3/25. Got a talent? Show it off at the KPSPTO 9th Annual Talent Show on May 6, 2016! Get your act together with friends or go solo. REGISTER NOW!! Details can be found in Peachjar. Visit 4ourschool.com to place online orders at your favorite retailers, while your purchases earn cash back for KPSPTO — at no additional cost to you! Visit the KPSPTO website for additional information on events and activities! Color-a-thon!!! KES has teamed up with KPS and MPES to participate in a color run on April 9 at GFMS. Registration begins at 9am and the run/walk begins at10am. Envelopes went home this week. Contact the KEPTO with any questions.Register here and don’t forget to pick KES!! School Breakfast. Running late in the morning? No problem. KES has you covered. School Breakfast is an ideal solution on mornings when kids are running late or parents have early commitments. Whatever the reason, if breakfast at home is not convenient, take advantage of breakfast at school from 9-9:30 am everyday for just $1.50. Yearbooks are on sale now! Purchase your child’s yearbook atwww.yearbookordercenter.com using code #24490. Early Bird Special until March 18th: 1 for $25; and 2 or more books for $23/ea. NOTE: Fourth graders receive a free yearbook, courtesy of the KEPTO. The photography company has send the large mosaic to the school! Come take a look at it displayed in the school lobby. Visit the KEPTO website for additional information on events and activities! To accommodate our new format, Community News items will be limited. Please contact the organization for further information. Annual pasta dinner, Saturday, March 19 from 5-7pm at the Carmel Fire House; Cost $10/pp, Children 4-12 are $5; age 3 and under-free. March 26 from 2-5 pm at the South Putnam Animal Hospital, 230B Baldwin Place Rd., Mahopac. Open to all Putnam Co. residents. Call 845 808-1390, ext. 43127 for information. info@putnambraves.com or visit www.putnambraves.com for more information. Power Hour Exchange: The New Face of Heroin Addition, March 30 from 7:30-8:30pm at the Hendrick Hudson Free Library. Doors open at 7pm. or www.pnwboces.org/tech. Contact for info: Gerry Battista at 914-248-2220. 2. Spring Enrichment Clubs for KES and KPS students! Soccer, Yoga, and Art Clubs start the week of March 28. Visit www.campherrlich.org/aasp for flyer and registration info. 3. Summer Day Camp! Early Bird Specials end March 1. Visitwww.campherrlich.org/daycamp for information. June 26–July 2, 2016. For children ages 9-12 years old. For information contact Janeen Cunningham at 845 808-1600, ext. 46120 or Deputy Michael Schmidt at 845 225-4300, ext. 42385. Memorial Day through Labor Day. Putnam County Veterans Memorial Park, Carmel. Current certification required at time of application. 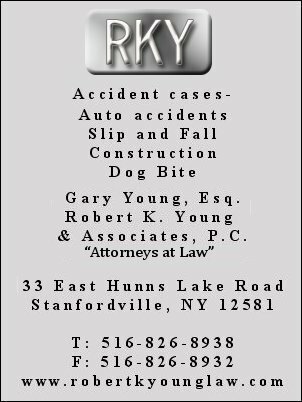 Contact Christopher Ruthven at 845 808-1994.